The Patch Mappings are Stored in a patch mapping file with the extention “.tgm” in the TriggerMaps folder. Please note that the Patch Mappings are independent of the Bank that is loaded. You can store as many different mappings as you might need. and then load the ones you need at any time. To use trigger maps you must have Midi IN 2 connected to a controller or a DAW. Press a Key or CC button on your midi controller and it should learn that. Click “OK” the Close that and the Midi Mapping should be applied to the slot. The Slot will turn “Blue” and will also show the Assigned midi Parameter on bottom. Once Done, Go to File > Save Trigger Mapping (Ctrl + Shift + S) to Save the Trigger Map to a file. For a Faster Workflow Select File>QuickLearn Option, now as soon as the Trigger is Learnt, the Trigger window will automatically close. 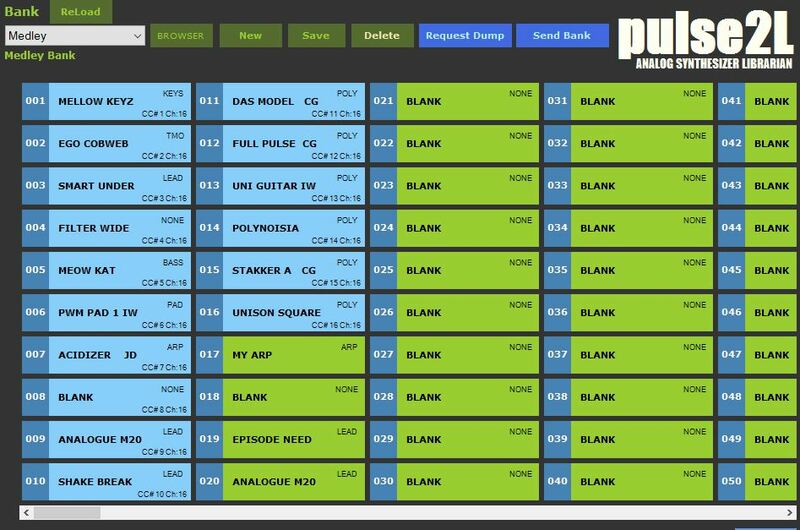 The Photo Above shows a custom bank (medley) and First 16 Slots Trigger Mapped to my controller (Korg Kronos Workstation, External Control Surface) which is connected to MidiIn2 of Pulse 2 Librarian.